I don’t want people to think better of Republicans. I want people to be as critical of Democrats as they are of Republicans. Both parties are really terrible. But the Democrats too often get a pass because they are better at branding and marketing. The last time a Republican Presidential candidate got more than 15% of the black vote was 1960. And yet the Democrats had a former KKK member in the US Senate until he died in 2010. In fact, Robert Byrd wasn’t just in the KKK, he recruited 150 friends to start a chapter! Robert Byrd used the N-word on live television in 2001. And then was re-elected as the Senator from West Virginia in 2006. Compare that to the current Democrat Governor from one state over, Virginia. Ralph Northam dressed in blackface when he was 25 (or KKK robes we don’t know which) as pictured in his graduate school yearbook. This guy is a clown. His defense was that he doesn’t think he is either one of the two in the racist picture, because he distinctly remembers wearing blackface on a different occasion. I wonder how he knew it was hard to get shoe polish off his face? As you can see, racism in the Democratic Party runs deep. And this shouldn’t surprise anyone who has any knowledge of history. But since most people get their information from memes these days, someone took it upon themselves to educate the masses. A bunch of Democrats wore white to Trump’s State of the Union address to protest Trump or something, I don’t know. 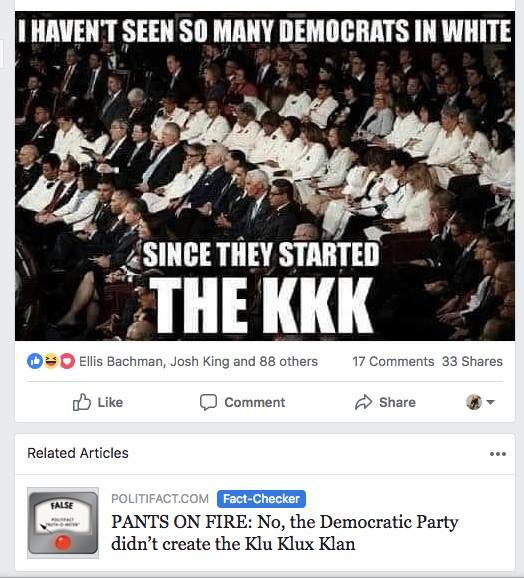 You’ll notice that below the meme, Facebook attached a fact check which claims the Democratic PARTY did not start the Klu(sic) Klux Klan. Not to get nit-picky, but the meme states that DEMOCRATS started the KKK, not the Party itself. And Politifact’s fact-check rested entirely on whether or not the Democratic PARTY started the Klan. One historian confirmed there’s a historic link between the Democrats and the KKK: Many angry Southern whites during the 1860s and 1870s were Democrats, and some joined the KKK. But according to J. Michael Martinez, who wrote the 2007 book “Carpetbaggers, Cavalry and the KKK,” it’s misleading to say the Democratic Party founded the Klan. Yet Politifact confirms that the Democratic Party honored the first Grand Wizard of the Ku Klux Klan when he spoke at the 1868 Democratic National Convention, shortly after the Klan was founded. Which brings us back to the original question, did Democrats start the KKK? It was founded as a political organization to intimidate black and Republican voters in the south during reconstruction after the Civil War. [T]he KKK engaged in terrorist raids against African Americans and white Republicans at night, employing intimidation, destruction of property, assault, and murder to achieve its aims and influence upcoming elections. There were two political parties… and the Ku Klux Klan aimed to influence elections AGAINST the Republican party. Well, that certainly sounds like Democrats started the KKK, doesn’t it? And they started it for overtly political purposes. The KKK was a political tool used by Democrats to help the Democratic Party win elections. Of course, another major strategy of covering up racist Democratic roots is saying that it isn’t the party today that it once was. Some people even say the parties flipped at some point… so Democrats get credit for Lincoln (who was a Republican), and Republicans get credit for the KKK (which was founded by Democrats). Well, when exactly did the parties suddenly and miraculously switch platforms? Neither party added proposed anti-KKK positions to its platform at the 1924 conventions. In 1963, the Democrat Governor of Alabama, George Wallace, stood blocking a doorway, refusing to allow a black girl to enter a white school that had just been desegregated by law. And if the Democrats were still racist in 1963, that means Democrat hero Franklin D. Roosevelt was part of the old racist Democratic party. (Big surprise, that the guy who put Japanese Americans in concentration camps was racist). Some people would say that the flip occurred with the election of President Lyndon B. Johnson in 1964. After all, George Wallace lost the primary against Johnson, which seems to be a rejection of Wallace’s racism. Plus, Johnson signed into law the Civil Rights Act of 1964. Still, only 69% of Democrats in the Senate voted for the Civil Rights Act, while 82% of Republican Senators voted for it. In the House, it was even worse, with just 63% of Democrats voting in favor, and 80% of Republicans supporting the legislation. However, Johnson went on to push “Great Society” legislation throughout the rest of his Presidency, aimed at reducing crime and poverty, and expanding the welfare state and social safety nets. You might think this would be a great thing to promote equality for disenfranchised blacks. The murder rate among blacks in 1960 was one-half of what it became 20 years later, after a legacy of liberals’ law-enforcement policies. So did the Democrats really abandon racist policies, or did they just change tactics? Let me know what you think in the comments.